We spend well over 250 days a year adventuring in the great outdoors in a wide variety of climates and ecosystems. Our two favorite places to play are forests and deserts, probably two of the more diametrically opposed ecosystems possible. Even I, a complete non-fashion-conscious dude, notice the difference in my hair and skin when we move between those two extremes. Willow’s pads eventually soften or toughen up depending on the type of ground she is romping on but there is always that transition period where she needs a little help from her dear old dad (me) to speed the process along. Sometimes she wears one or the other pair of her dog boots to protect her little Princess Paws from the worst abuses that Mother Earth can dish out but even those allow a bit of dirt and sand in or cause a bit of chaffing on her tootsies during an hours-long hike. 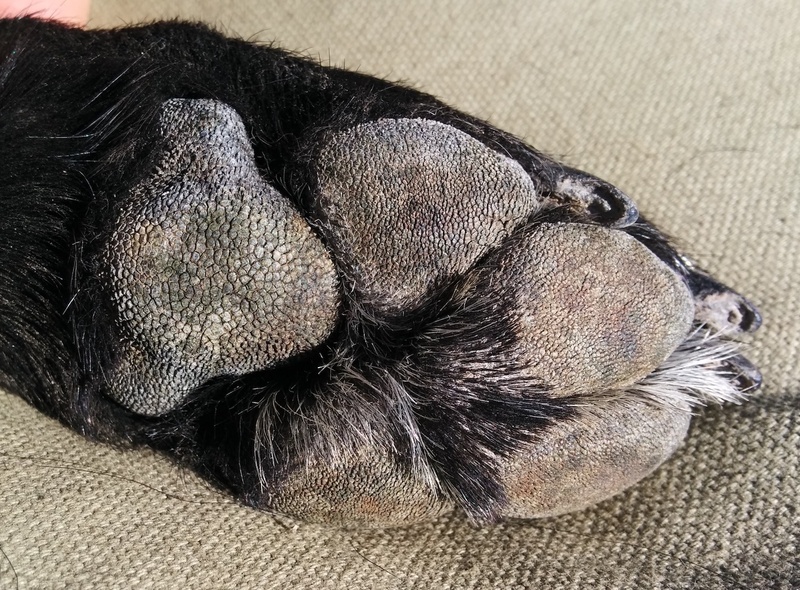 To give her feet a leg up so to speak we have found that Musher’s Secret Pet Paw Protection Wax works great to coat, sooth and relieve (just like Pepto-Bismol for foot pads) those minor irritations that sometimes crop up. 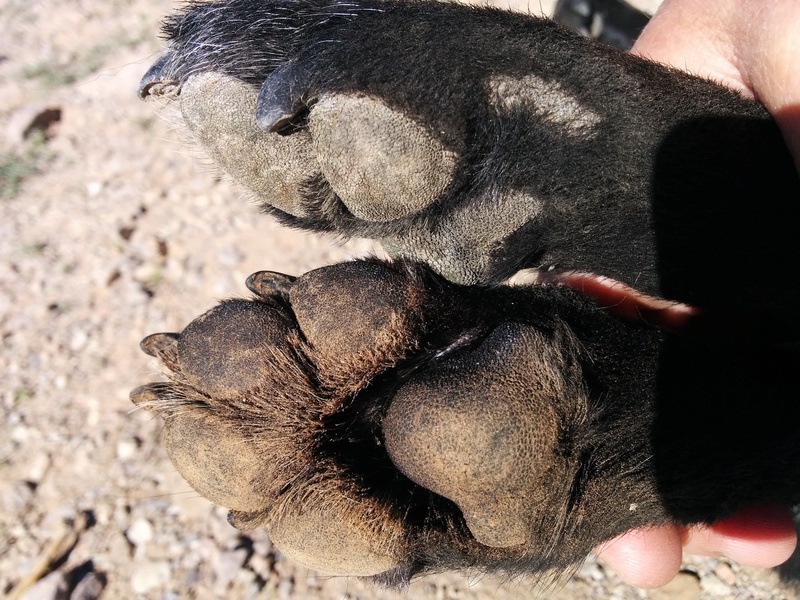 When crafting this post we have been in the American Southwest for about a month now and Willow’s paw pads are just starting to get back into desert dog shape…which means hard and dry and rough. The last place we spent a nice chunk of time in was Humboldt County, CA with its literal 99% humidity and so going from there to here with humidity levels at least half of that has been a shock to the system. We’re at the point in this ecosystem transition where she is no longer obsessively licks her paws to soothe them after days of romping on brutal volcanic, igneous rock and remnants. 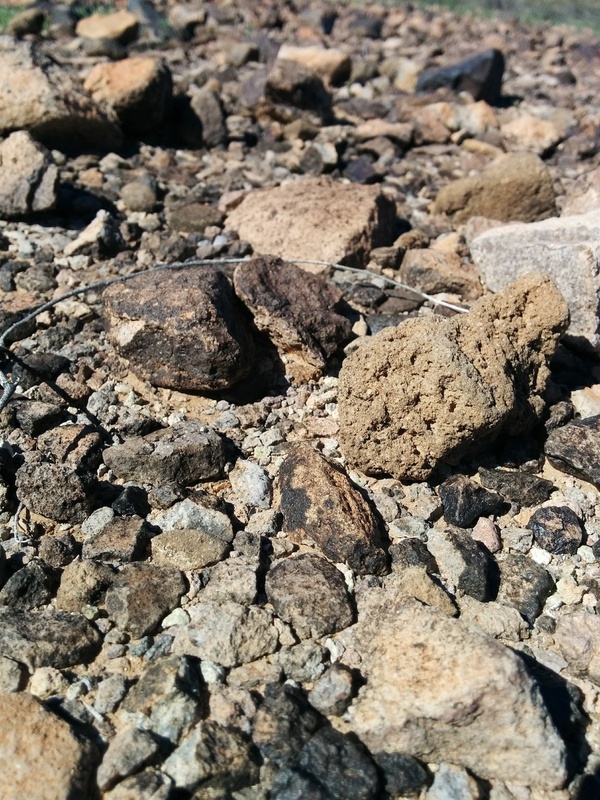 Sometimes though she still comes up limping due to a sharp, stabby thing embedded in a foot or stepping wrong on a sharp or abrasive rock or just plain getting worn down from too much romping. 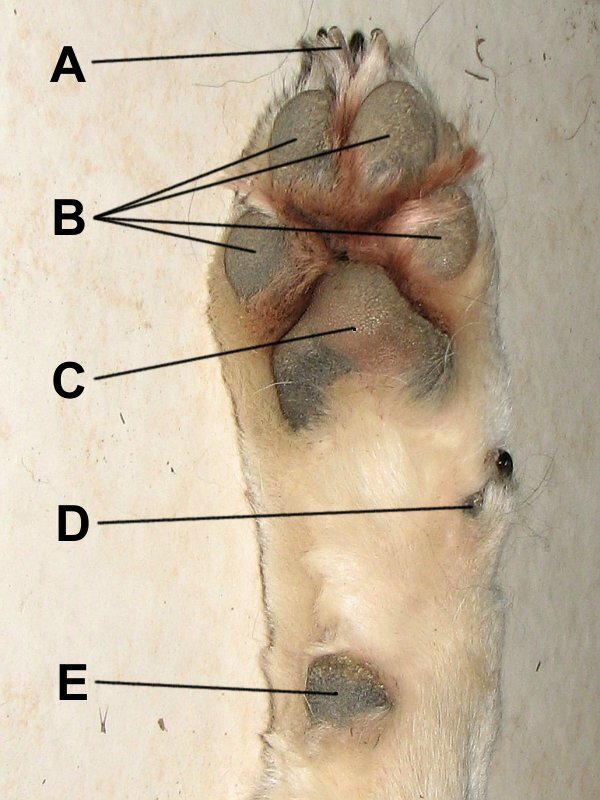 Exterior Dog Paw Anatomy: (A) the claw, (B) digital pads , (C) metacarpal (on the front paws) and metatarsal (on the rear paws) pad, (D) dew claw, (E) carpal pad. 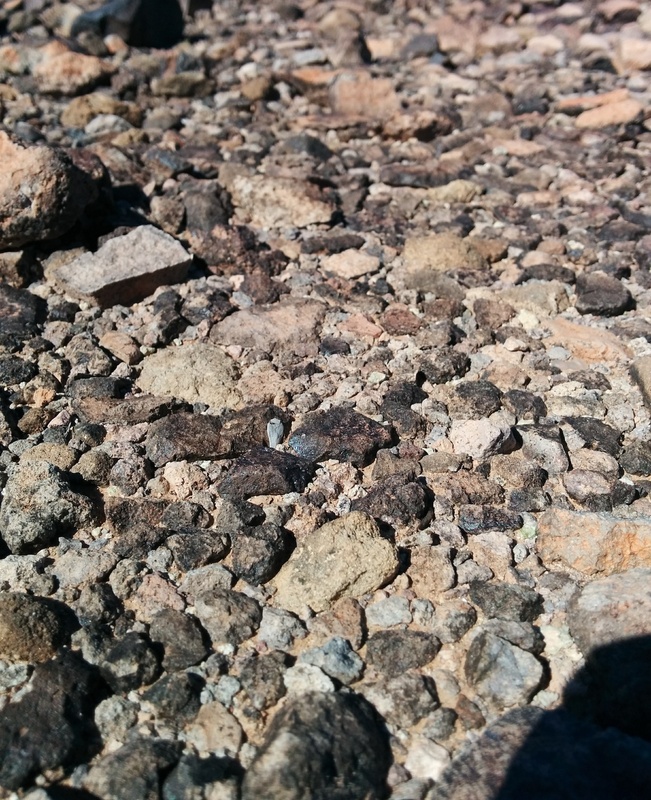 All those parts can get bruised, battered or burnt when running over the hot, volcanic rock that covers huge sections of the desert areas we regularly find ourselves exploring as well as hot sand, abrasive sandstone and coral, hot concrete and frigid ice. This is our fifth trip into the American Southwest desert region in two years and each time she and her Princess Paws seem to do a little bit better, a little bit quicker than the time before. Still though, as a caring dad I want her to be as comfortable as possible and so did some research on paw balms and found many rave reviews for Musher’s Secret and so we decided to give it a try. 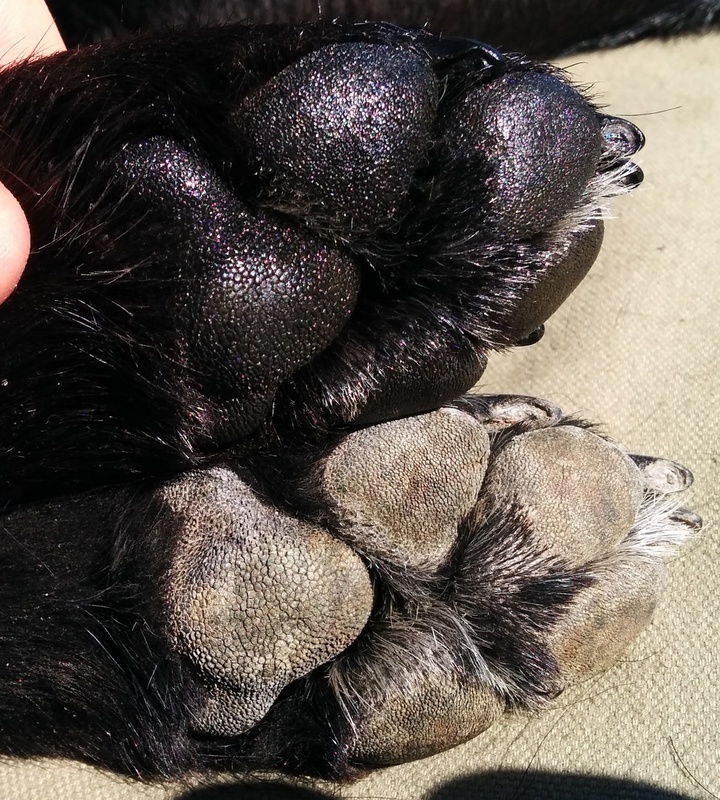 While most of that may be true we have found that using it before an outdoor romp tends to make her paws collect dirt and debris and causes some minor issues and so we have instead defaulted to using it after such activities more as a salve to help sooth and repair her pads after a hard day of romping. As soon as it is applied to the warm pads it softens up and flows into all those nooks and crannies to protect and soothe. It is somewhat like an old wooden boat with bleached, weathered wood versus one that has recently been treated to a new coat of protective marine varnish. We now usually wait until bed time and then have a daddy/dog daughter bonding session which includes luxurious paw massages when I can apply the goop. This also promotes increased blood circulation to the area. The first few times she was sensitive about her paws and would pull away with annoyance. Then, once she realized what I was doing and how well it made her pads feel, she would grunt like a happy pig and be asleep before I started on a second paw. Spoiled AF. Depending on the terrain, we have on a few occasions broken our normal rule and put the Musher’s Secret on before our daily romp by applying it to Willow’s pads and then immediately putting on her boots. Reminds me of Curley in John Steinbeck’s “Of Mice And Men“ who made a habit of keeping his hands soft and supple by filling his gloves with vaseline. Sorry…English degree, literary geek tangent. 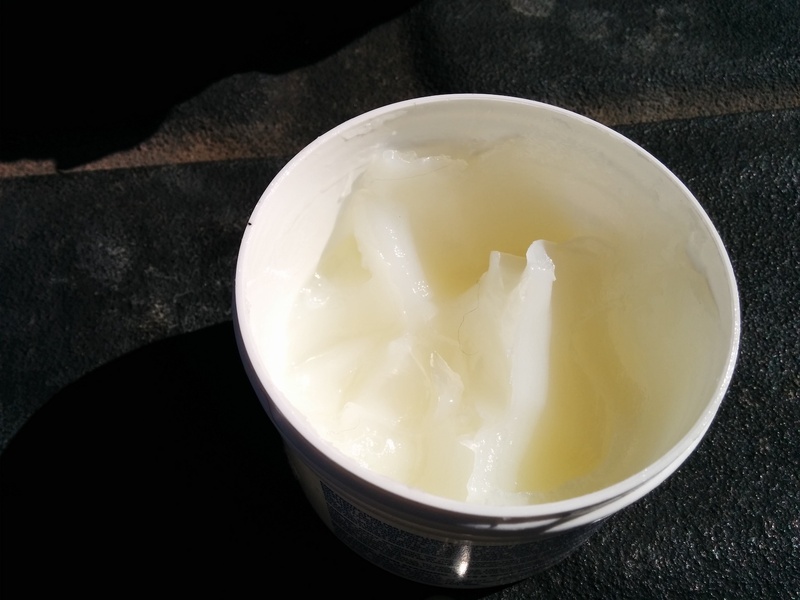 Like we mentioned before, once this goop is applied to the warm pads it thins out and can be easily spread and massaged into and around each pad. We bought this jar on January 30 of last year and still have about a half a jar left. Several times we have met people and their dogs and the subject of paw protection comes up (usually because they see Willow wearing a pair of her dog boots). We have touted the pluses of Musher’s Secret to them and even offered them a finger full to try out on their pup’s paws. Almost universally the next morning they have stopped by our camp and thanked us for the trial and explained how well it worked both on the dog’s paws but also on their fingertips and nails as well. One lady even exclaimed that she would start buying this for her cuticle care instead of the expensive human product she has used for years. Musher’s Secret is supposedly used on sled dogs during the Iditarod and others who use their dogs as working animals on farms and ranches in harsh environments all over the world. If it works under those conditions we cannot imagine it wouldn’t work wonders for dogs who live much less strenuous and pampered lives and we have found that to be true in our travels. 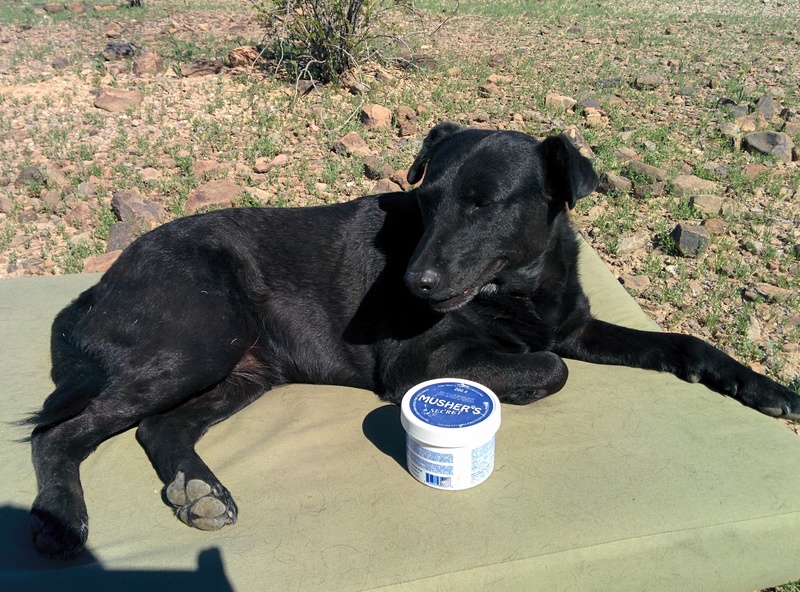 If you have a dog companion who ends up with tender paws after your excursions you would do well to give this product a try at let us know how it works for you.